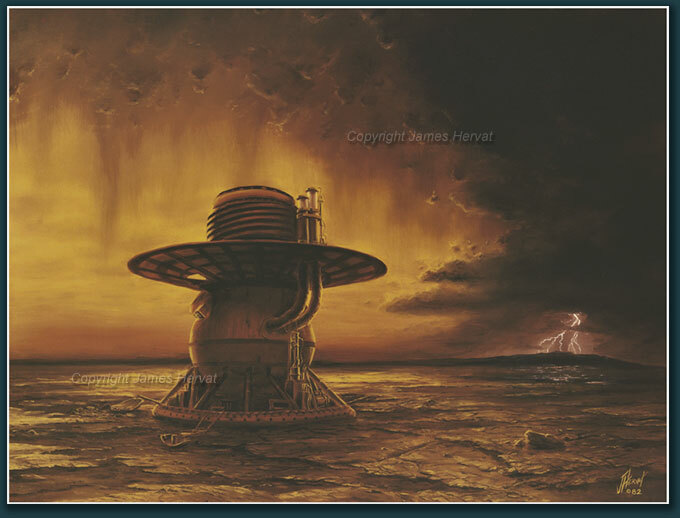 Venera 14 on Venus - The Soviet Union conducted an ambitious program of Venus exploration in the 1970's and 1980's resulting of the first images from that planet's hellish surface. Venera 14 on Venus (1982) - The Soviet lander survived intense heat and pressure long enough to relay images of the surrounding lava fields of Phoebe Regio in 1982. The curious appearance of the lander was dictated by the severe conditions beneath the planet's thick cloud cover. The surface of Venus is perpetually subjected to temperatures of over 800 degrees F. and atmospheric pressures that are equivalent to those at 3,000-foot ocean depths. Not a nice place. Earlier Soviet missions into Venus' atmosphere resulted in loss of radio transmission well before the surface was reached. The use of conventional parachutes in the dense air made for painfully slow descents, essentially pressure-cooking the landers. Consequential hardware or instrument failures (these were not entirely unexpected) ranged from the batteries not surviving the prolonged descent, to pressure leaks into the instrument compartment, to disintegrating parachutes. Subsequent Venera missions managed to land intact using a revised atmospheric entry method which released drogue chutes at a higher altitude and then used a circular aero brake which allowed a much quicker traversal of the remaining distance to the surface. Publication: National Geographic, Sky and Telescope, Astronomy, The Planetary Report, others. High-quality reproductions of all the artwork in this gallery are available from my secure Print Store. They are offered in a range of sizes, printed on paper, canvas or other print substrates. Prints can be ordered unframed or you can choose from a selection of framing and matting options. Items are usually shipped in 2-3 business days and come with a 30-day satisfaction guarantee return policy. Please see the PRINTS page for more information and a link to the Print Store.